The prefectures of Ehime and Kochi on the Japanese island of Shikoku may be among the smallest producers of sake compared to the rest of Japan, what they do make punch above their weight in terms of quality. Daniel Goh investigates Shikoku sake. A bunch of us journalists were snuggled in the tasting room of Sakura Uzumaki Sake Brewery, tucked in the small city of Matsuyama in the Ehime prefecture on the Japanese island of Shikoku. Shigemasa Shinohara, the brewery’s president, was sharing about the specifics of Ehime sake, and those of his brewery in particular. 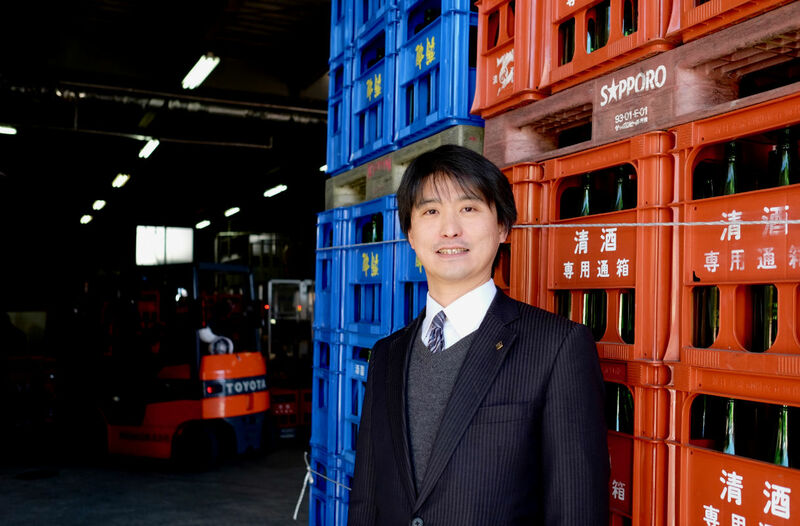 “Demand for sake in Japan has been falling over the past decade,” Shinohara admits to the room of wine writers, accredited wine judges, and F&B journalists gathered from across the world. His brewery’s production volume has plummeted in tandem, he shares wistfully. It’s not just a random, personal observation. According to numbers gathered by Japan Sake and Shochu Makers Association (JSS), total sake production in Japan has fallen from around 1.4 million kilolitres in 1975 to just over 0.4 million kilolitres in 2012. The number of breweries across Japan also fell from 3,100 to around 700 during this period; that’s a market contraction of more than 70% over three decades. There are probably a multitude of reasons for this downwards trend; the main one, observers say, is the switch in consumption to beer, wine, whisky and other alcoholic beverages by the younger generation. The shocking fall in demand also forced those that remain, like Sakura Uzumaki, to rationalise their business. The silver lining in that very dark cloud is that demand for premium sake – both domestically and overseas – is actually growing explosively. Despite its southerly location, Ehime – home to 42 sake breweries – is unusually suited for sake making. Thanks to the Shikoku mountain range that cuts through the prefecture – including the soaring Mt. Ishizuchi – Ehime gets plenty of snow in its blustery winters that’s ideal for brewing. Like Sakura Uzumaki, fellow Ehime brewery Ishizuchi Shuzo Corporation – located in Saijo at the foot of the mountain it’s named after – also upturned tradition. Most toji are hired seasonal employees, but the family-owned brewery appointed a family member for the coveted spot. Minoru Ochi trained at a brewery in Ibaraki prefecture before he returned in 1997, joining us his elder brother and brewery vice president Hiroshi Ochi in the family business. Ishizuchi similarly moved towards making premium sake, mostly because the elder Ochi wanted to drink better sake. “I’m a huge fan of sake,” laughs Hiroshi Ochi, “so when we made this a family operation we decided to make the really good stuff.” An example of “the really good stuff” is their Ishizuchi Junmai Daiginjo Funashibori; whereas sake is most commonly pressed in an accordion-like contraption called the assakuki, the funashibori method employs a more delicate way of pressing using a mesh bag that’s squeezed in a wooden box. That produces a refined sake that doesn’t pick up too much harshness from the lees. Only the shizuku method – literally droplets, with only the free-run juice from suspended mesh bags collected and bottled for sale – makes more elegant sake (with a correspondingly high price tag). How good is good, you ask? There’s strong demand for its high-end sakes, with much of its output is exported out of the prefecture (there’s even an Ishizuchi sake bar in Singapore). And its production volume is increasing too. After we toured his brewery Hiroshi Ochi led us to Ishizuchi Shrine, a Shinto redoubt situated partway up the mountain. There, one of his premium Ishizuchi sakes was used as an offering to the gods. Ochi’s face beams when the presiding priest praised his sake effusively. The kami, or spirits, must approve. Over in the neighbouring prefecture of Kochi, the president of Tsukasabotan Brewing Co, Akihiko Takemura, was in a little bit of a fluster. It was sake making season, and while he was more than willing to be a gracious host he wasn’t quite sure how to get a gaggle of jetlagged journalists out by seven in the morning to see rice being steamed. In atypical Japanese fashion, Takemura (pictured below with Tsukasabotan toji Toru Asano) decided to let things run its natural course; we turned up in time to help carry sacks of steamed rice from the industrial steamers to Tsukasabotan’s koji room for them to be innoculated with koji mould. Kochi is one of the more curious places in Japan that brew sake. It teeters at the southernmost limit for sake brewing- the prefecture sees some of the highest rainfall in the country, yet also has amongst the most hours of sunshine; conditions that are perfect for growing citrus – it’s the largest producer of yuzu in Japan – but not quite so for sake. 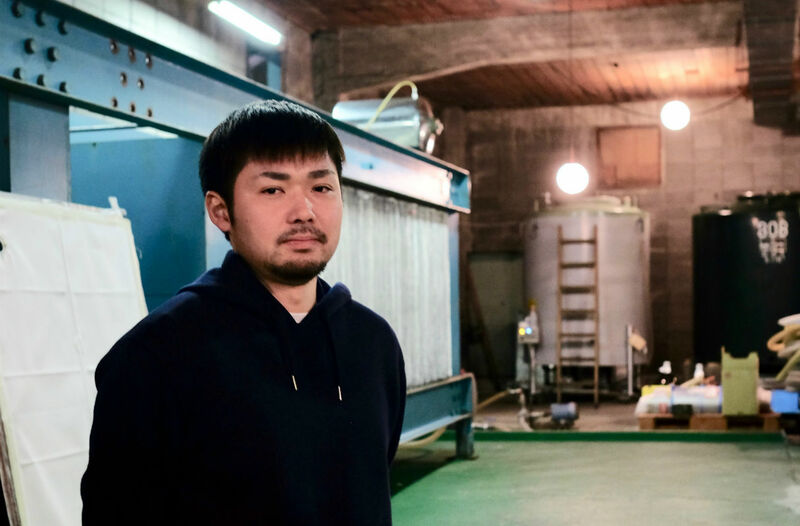 “Unlike the more northern prefectures some days it can get a bit too warm in Kochi to make sake, which is why we have air-conditioning in some of our buildings,” Takemura explains, pointing around. 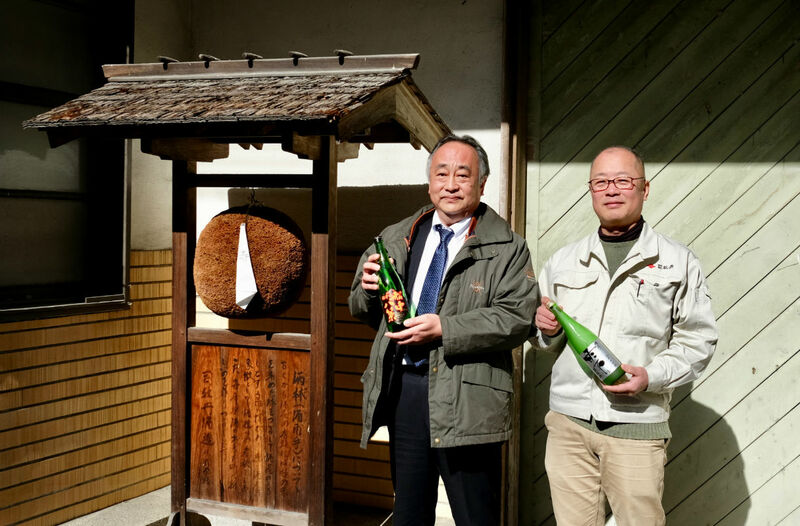 Takemura, also the chairman of the Kochi Sake Brewers Association, is convinced that Tosa sake – Kochi was previously known as Tosa – is highly underrated. “Tosa sake is perfect for pairing with food,” he insists, “and can easily go with most cuisines around the world. 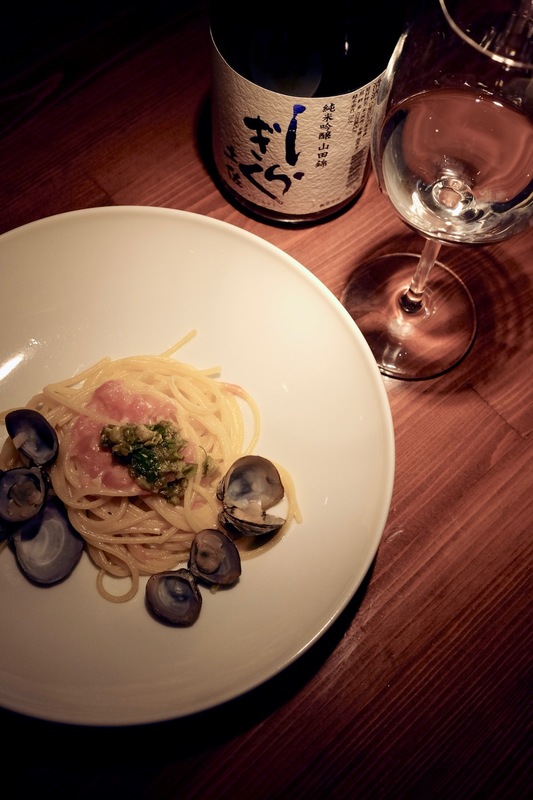 To prove the point, he arranges for a special sake and food pairing session for us at one of the more prestigious restaurants in town – Resort Dining Se Relaxer, opened by intrepid owner and chef Takumi Yamamoto. His specialty? Italian, but using produce sourced from around Shikoku. Chef Yamamoto pairs a Tosa wagyu beef dish with the Tsukasabotan Kimoto Junmai Kamawanu, to Takemura’s visible delight. 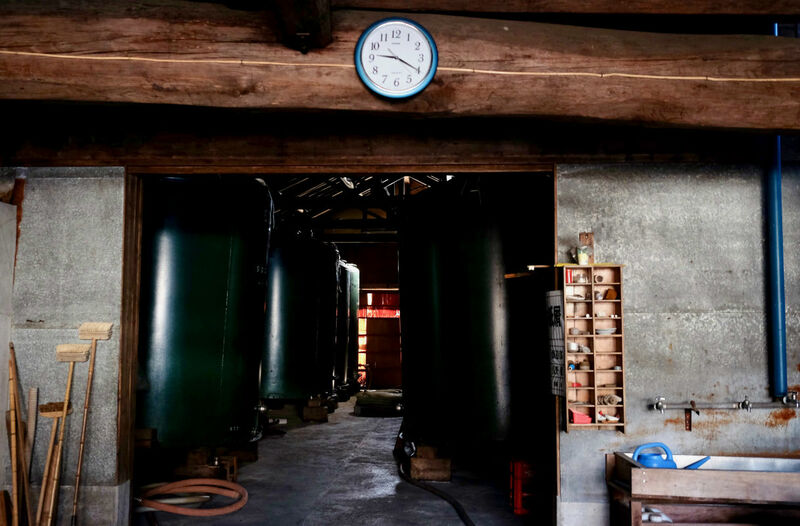 The lactic sourness and slight funk from the kimoto method sake – a style which allows the inclusion of wild yeast present in the brewery – helps cut through the richness of the beef, and then dries out to cleanse the palate. Takemura is right. The sakes of his prefecture tend to be lighter, and more crisp and dry compared to its mainland counterparts. Lower in amino acids – which gives the umami flavour – they tend to complement rather than compete with the flavours in food. The next day the bunch of us journalists were also introduced the traditional Tosa banquet known as the okyaku. It’s a gregarious, riotous affair where guests are plied with heaping platters of food – in a style the people of Kochi call sawachi-ryori – washed down with copious amounts of dry Tosa sake. We were also expected to participate in drinking games (which was incredibly fun mainly because even when you lose, you win); you were not expected to get back home on your own steam. Despite the drunken debauchery that was the previous night’s okyaku, we managed to see sake rice being steamed the next morning after all. We were at Suigei Shuzo, considered a cult sake brewery by many sake enthusiasts around the world. 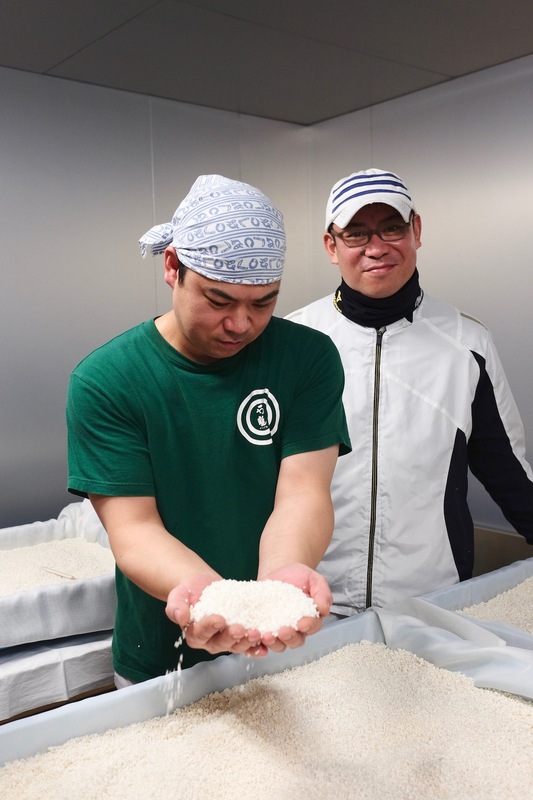 We even helped shovel steamed rice and stirred fermenting mash; President of Suigei, Hirokuni Okura, was keen to put us through the paces of each step of the sake brewing process. Founded in 1872, it’s considered a very young brewery compared to most of its counterparts. Perhaps it’s exactly because it’s unburdened by tradition that Suigei leaps easily into innovation. It has developed slightly different techniques when it comes to the preparation and the innoculation of koji, for example. 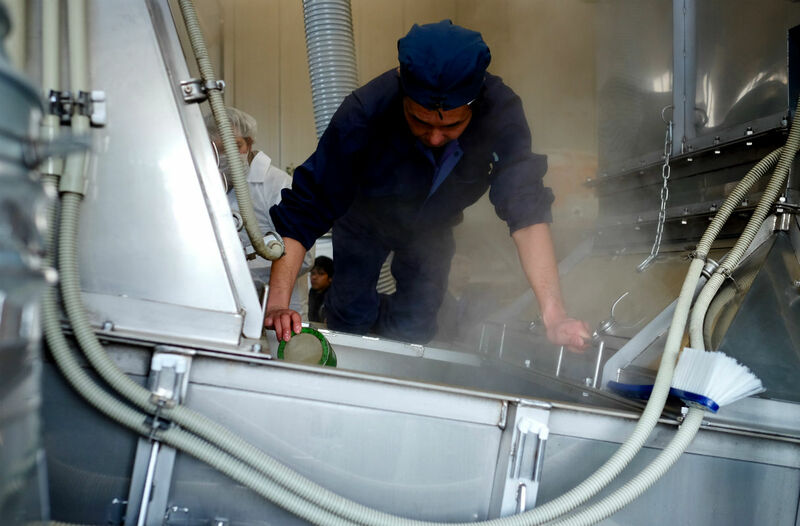 Whereas most breweries only innoculate koji inside a koji room, Suigei begins the innoculation process as the steamed rice is being transferred via conveyor belt (pictured above) into the koji room for more even innoculation. 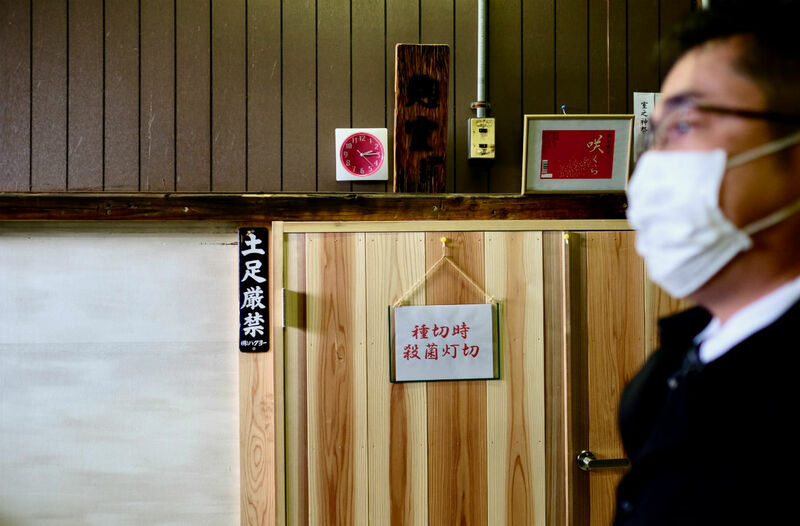 Unlike most other sake breweries struggling in the current flagging demand, Suigei has a different – if welcome – problem. “We currently can’t produce enough premium sake to meet demand,” Okura coyly admits. Indeed the “drunken whale” of Suigei was coveted around the world. Its top-end, limited-release luxury range – the Mann, Zui, Daito and Sho – sees snaking queues at Tokyo sake specialty shops on launch day. “We’re currently planning to build a new, expanded brewery,” Okura (pictured below) adds, showing us the mockup of the new facility. It’s a refreshing perspective, because despite the doom and gloom in the industry the success of the likes of Suigei – as well as that of Yamaguchi prefecture’s Asahi Shuzo, which makes the sought-after Dassai range of luxury sakes – shows sake’s potential and upside as well. It’s also interesting to note that what’s happening on Shikoku – an island nestled in the crook between the main island of Honshu and the most south-westerly island of Kyushu, with a land size bigger than that of Kuwait but home to just under four million – is really a microcosm of Japan’s sake industry. More importantly though, we’ve learned that despite its tiny production, both Ehime and Kochi produce sake that rival their mainland counterparts in terms of quality. A big thank you to the Japan Sake and Shochu Makers Association (JSS) for inviting us on this trip. All photos copyright of SpiritedSingapore.